Pacific Power Source manufacture high performance AC power supplies and frequency converters rated from 500VA to 625kVA. 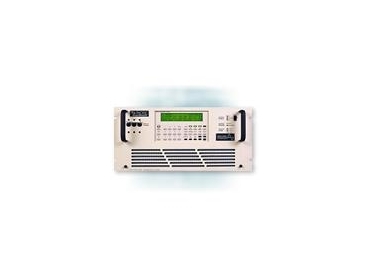 AC power supplies and frequency converters are supplied by Scientific Devices Aust . Pacific Power Source provide their AC power supplies and frequency converters to industrial, military and commercial customers. These products from Pacific Power Source feature fast transient response, tight regulation, high- peak current capability and low impedance. AC power supplies and frequency converters from Pacific Power Source have an intuitive software interface, known as the UPC Studio, which gives the users maximum control with minimal effort. The control and operating features provide operators with a high degree of application versatility and easy use. The AC power supplies and frequency converters can be used in applications that range from simple, manually controlled frequency conversion to harmonic testing and sophisticated bus programmable transient simulation. The Pacific Power Source AMX Series AC power supplies and frequency converters offer broad bandwidth of 50 kHz small signal and peak/RMS current of 4-6:1, which can produce high quality, low distortion output power into dynamic loads. The AMX Series from Pacific Power Source comprise high performance linear AC power supplies and frequency converters, which cover the power range from 500 VA to 12 kVA with standard models and up to 30 kVA with the M5283 option. The product line of the AMX Series offers single and three phase models. Output power ratings of the AMX Series are based on a combination of input line, output voltage, power factor and temperature. The AMX Series from Pacific Power Source offer low acoustic noise, easy installation and maximum power per cubic inch of rack space. Control and operating features provide a high degree of application versatility that can be used easily by test engineers. The AMX Series AC power supplies and frequency converters from Pacific Power Source provide accurate AC output voltage. When the AMX Series is enabled, accuracy improves to ±0.03% referenced to the power source internal voltmeter. The AMX Series feature the Programmable Dynamic Output Impedance that provides the operator with dynamic control over the output impedance of the AC power source. Operators can programme the positive or negative impedance, using the output current term as a conditioned feedback signal to the output voltage circuits. The Programmable Dynamic Output Impedance simulates and compensates the effects for high peak current, distribution or transformer losses up to ±10% of the output voltage. The Programmable Dynamic Output Impedance feature creates positive, negative or Zero output impedance (Zo). It compensates for line distribution or transformer losses and simulates a soft power line for product testing. The compensation range is ±10% of the output voltage. The AMX Series store 16 different waveforms in the waveform library for execution as part of a steady state programme or for substitution in any output phase as part of a transient test programme. The memory location #1 is a non-editable high resolution sine wave. Memory locations of 2 to 16 are editable and can be substituted in any output phase. A number of waveforms can be stored on the computer for those using a programmable UPC. The Waveform Edit feature of the AMX Series can modify a stored waveform by specifying the desired waveform amplitude at each specific phase angle. The Waveform Analysis feature of the AMX Series provides graphic and numeric displays of a voltage or current waveform in the harmonic structure. The data provided includes the magnitude of each harmonic in percentage, the total harmonic distortion and the odd and even harmonic distortion in percentage. The Waveform Synthesis of the AMX Series can create the required AC Test Waveform from harmonics. The process of Waveform Synthesis involves keying in the harmonic multiple, the amplitude and the phase angle for each desired harmonic. The Time-based Transients in the AMX Series AC power supplies and frequency converters can create and execute on command, transients occurring linearly over a specified time segment to modify output voltage or frequency. The Cycle-based Transients of the AMX Series can create and execute substitute transients for a selected waveform in the output for 1 to 100 cycles on command.